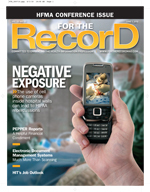 The potential use of cell phone cameras by staff and others forces hospitals to focus on how best to protect patients’ privacy. The differences between the ways the two incidents were handled raise serious questions about the use of cell phone cameras. What does HIPAA have to say? Nothing specific; the regulations don’t appear to distinguish between types of electronic devices. However, camera phones are most likely included under the broad definition of electronic media: “Electronic storage media, including memory devices in computers, (hard drives) and any removable/transportable digital memory medium, such as magnetic tape or disk, optical disk, or digital memory card; or Transmission media used to exchange information already in electronic storage media. Transmission media include, for example, the internet (wide-open), extranet (using internet technology to link a business with information accessible only to collaborating parties), leased lines, dial-up lines, private networks, and the physical movement of removable/transportable electronic storage media. Certain transmissions, including of paper, via facsimile, and of voice, via telephone, are not considered to be transmissions via electronic media, because the information being exchanged did not exist in electronic form before the transmission.” HIPAA’s section on disclosure of protected health information lists “full face photographic images and any comparable images” among the many items that must be removed to render health information individually unidentifiable. The preponderance of handy devices that healthcare workers can easily tote around should force hospital management to reexamine its employee bylaws. Landoll recommends prohibiting the unauthorized use of camera phones, allowing flexibility for properly secured, hospital-owned cameras using approved applications. Further, if picture taking is permitted in some areas but not in others, the restrictions should be posted clearly, which calls for extra diligence in enforcing the policy. Markus says organizations need to educate not only their employees but also others who work at the facility, including medical residents, volunteers, emergency-services personnel, physical plant contractors, lawyers, accountants, and any number of people who move in and out of the hospital on a daily basis and have access to patient care areas. Institutions can set up orientations for volunteers and on-site vendor employees and make training arrangements with medical schools to educate residents. Vendors can also be required to sign a confidentiality agreement that includes the facility’s policy on camera phone use.